recreational gymnastics levels experience: Gym360! Developed by Kyle and his Olympic Coach, Kelly Manjak, this unique program is an adaptation of the CanGym program with a Kyle Shewfelt Gymnastics twist. This program was designed to offer participants an all-around gymnastics experience while also encouraging the development of important physical abilities and life skills. In this program, participants will navigate their way through 10 different levels while they are tested on various gymnastic progressions, skills and element combinations. Specific strength, flexibility and character components will be assessed as well. Each of the Gym360 levels consist of unique requirements which must be mastered in order to graduate to the next level. Once participants conquer all 10 levels, they will earn their very own Gold Medal! We truly believe this program will not only teach participants cool new gymnastics tricks, but it will give them a wonderful and well-rounded foundation for an active and healthy life. Special Notes: If new to gymnastics and between the ages of 5-6 years, we recommend a GymKids Senior class first for a more positive experience. 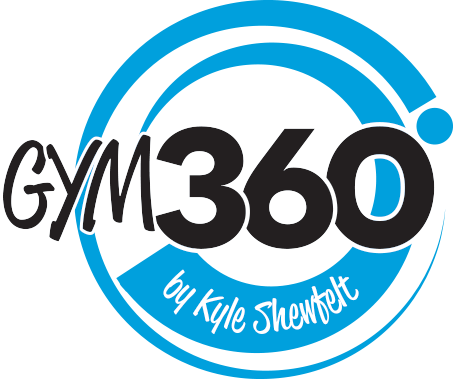 *Students who achieve all skill/developmental targets may graduate to Gym360 Level 1 before age 6 with coach recommendation after completing one session of Pre-Gym360. Please speak with your coach or our office for more info. This co-ed class is an excellent introduction into the Gym360 stream of programming and specifically designed with ages 5 – 6 years in mind. It is an excellent option for youngsters who are ready for a longer class and more of a challenge. Participants will maneuver through multiple circuits on all of the gymnastic apparatus while learning basic skills and body positions. A greater emphasis will be placed on correct technique, strength, flexibility and form while they prepare themselves for Gym360 Level 1 and our Specialty programs. Rest assured, having fun is still the main priority! Classes begin with a non-musical active warm up and end with a high five! Fun for: Those who are looking for a longer class with a more advanced skill base. The perfect head start on the Gym360 program. Welcome to the wonderful world of Gym360! This co-ed structured class is a must do for every child and is all about the fundamentals. Each 1.5 hour class will have participants taking on a variety of new challenges on the gymnastic equipment. This introductory gymnastics class is physical activity completely disguised as fun. Participants will see a strong emphasis placed on maneuvering through the gymnastic experience with safety in mind. Children will work on proper landing techniques, forward rolls, mini-cartwheels and various balances, locomotions, supports and basic gymnastic body positions. They will learn about the movement potential of their body as they hang from the rings, swing on the bars and bounce on the trampoline. Warning: Although we try to tire them out, a bit of bed bouncing may still occur at home. We apologize in advance. Fun For: Everyone! We highly encourage all participants to take Intro to Gym360 for a strong gymnastics and fitness foundation. This is the next step in the Gym360 journey. Participants will work on more advanced skills including skin the cats, backward rolls, headstands, bridges and forward dive rolls. Key progressions for cartwheels, handstands, pull overs, casts and long hang swings are also introduced. As always, safety is of utmost importance and proper falling techniques are engrained. An emphasis is placed on correct body positions as the expectation is slightly increased. Strength and flexibility are also a major focus in this program; as the skills become more challenging, physical preparation is key to successfully mastering the more difficult requirements. Fun for: Everyone! This class is the second essential step in everyone’s sporting journey. Although participants may realize by this point that the Gym360 stream is not their path, this class will reinforce the critical movement patterns for success in our specialty programs and all other sporting endeavours. This class is the natural progression for those wanting to take the next step in learning authentic gymnastic skills on the Olympic apparatus. Students will work on walkovers, cartwheels, roundoffs, front handsprings, back hip circles, handstands, handstand walking, casts, beat swings and more advanced progressions for front saltos. This is where becoming a ‘gymnast’ really starts to take shape. Fun for: Participants who love learning new gymnastic skills on the Olympic apparatus and want to improve their strength and flexibility. This is the next step in our intermediate level of programming. Students will work on back handsprings, front and assisted back saltos, aerial progressions, long hang swings to pull over and the coveted front handspring vault. They will also be expected to put the finishing touches on their walkovers, front handsprings, swing 1/2 turns, beam cartwheels and other already mastered elements. Some class time will be dedicated to specific strength and flexibility conditioning exercises to help improve physical abilities. Fun for: Those who aspire to learn more technical and difficult skills on the gymnastic apparatus. Please note that this is an advanced intermediate program and successful completion of Gym360 Level 5 or equivalent skill level is required. Please contact us with any questions you may have or to arrange for an assessment if you think this may be the right fit for your child. *We highly recommend that Advanced Gym360 participants register for 2 times a week so they can maintain the required strength and flexibility in order to perform the most advanced skills found in this program. Students in our advanced program will work towards peak skills such as kips, free hip circles, roundoff back handspring back tucks, front layouts, twisting elements, flipping vaults and more so they can ultimately earn their Gym360 Gold Medal. This class is all about challenging yourself and having fun with your peers. Patience and a diligent work ethic are required to excel in this class. Fun for: Those who aspire to learn more technical and difficult skills on the gymnastic apparatus. This is an excellent option for those who may want to one day participate in a competitive stream of programming or who want the ultimate challenge in their recreational gymnastic experience. Please note that this is an Advanced program and successful completion of Gym360 Level 7 or equivalent skill level is required. Please contact us with any questions you may have or to arrange for an assessment if you think this may be the right fit for your child.